At Grand Dental Center, helping you achieve optimal oral health is our passion. Our Grand Rapids dentists provide the highest quality of dental services in a professional, gentle, and caring atmosphere. We pledge to always give you our best…you deserve it! 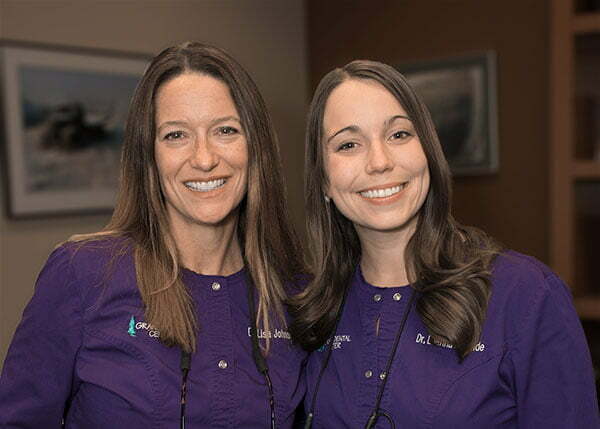 Dr. Lisa Johnson and Dr. Leanna McBride are general dentists offering a complete range of dental services, from basic preventive care to cosmetic procedures and restorative dentistry. When you visit Grand Dental Center, expect to be treated with care by our friendly and competent team. We are here to help you every step of the way, from your first call to all of your follow-up and recare visits. Our office is conveniently located in Grand Rapids, MN on Golf Course Road across from the Grand Itasca Medical Center. Ample parking and complete handicap access are provided. As dentists in Grand Rapids, MN, part of our promise includes giving you the best information to help make the best decisions about your oral health care. We hope this website will be helpful to you learning about our dental practice, available dental treatments, health recommendations, payment and insurance policies and financing. Give us a call today at 218-326-0339 to schedule an appointment or ask any questions you may have. We look forward to seeing you! Dr. Lisa Johnson (l) and Dr. Leanna McBride welcome you to Grand Dental Center in Grand Rapids, MN. Mon, through Thurs. : 8:30 a.m. to 5 p.m.
Why Choose Grand Dental Center? We’re committed to being your full service, family dentist office. Dental emergencies can usually be seen the same day. Call 218-326-0339. Porcelain veneers cover your teeth and completely reshape your smile. Routine dental cleanings and exams are key to your optimal dental health. Dentures or partials are options for replacing one or more missing teeth. Fix structural problems like damaged or missing teeth and restore functionality. Invisalign is the “clear choice” for patients who need mild orthodontia. A crown strengthens a tooth that can’t be restored with fillings. Fillings repair and restore teeth that are decayed, worn or damaged. We’re extremely proud of our patient satisfaction rate. Here’s what some of our patients have to say about our dental practice. We had a spectacular experience at Grand Dental Center. My 3 year old son had his first ever dentist visit here, and it was a breeze. The staff took the time to explain every tool to him, letting him hold and understand what was going to be happening. They talked to him about the importance of getting the “sugar bugs” off of his teeth and that brushing is the best way to do that. We STILL talk about sugar bugs every day (and it’s been two months!). The service was not too much for our small budget either; I am so grateful we went here. Great friendly dental hygienist today. I’ve had work done by both Drs. McBride and Johnson. Both excellent with great advice and I’d certainly recommend them. They make me smile and make my smile one to remember. Great job. After relocating to the area I was referred to Grand Dental Center, and I was so glad I was. I actually enjoy going to the dentist now. The cleanings are gentle, efficient and the staff is very knowledgeable. I highly recommend them. I’ve been with this clinic for years. The skill and service provided by the staff has always been great. The facility itself is also clean, bright, and new. Great place to take care of your teeth.